Born 15 August 1909, Hamilton, Scotland. John Cameron Bryce (1909-2001) was a graduate of the University who was Bradley Professor of English Literature from 1965 to 1979. The Bryce Bequest is named for him. 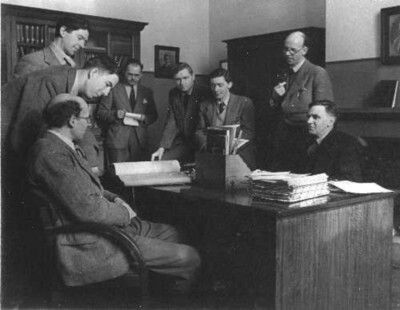 Bryce graduated MA in 1932 and won the George A Clark Scholarship, which enabled him to continue his studies for four years in France, Germany and at Oxford. He lectured briefly at the University of Durham but was forced to quit by a detached retina which hindered his ability to read and write. 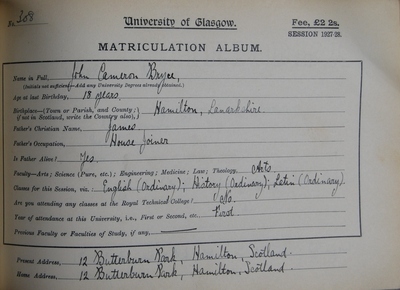 In 1938 he came to Glasgow as an assistant lecturer in the Department of English, becoming Senior Lecturer in 1955. After succeeding to the Bradley Chair in 1965, Bruce was heavily involved in the preparation of the Glasgow Edition of the Works and Correspondence of Adam Smith.